Withings, the French technology company known for Internet-connected blood pressure monitors and scales, is adding a device specifically designed for the smallest member of your household. The Withings Smart Baby Scale includes a basket for weighing an infant, which can be removed to transform the unit into a toddler scale. The scale connects wirelessly to iPad, iPhone or iPod Touch, tracking ongoing information with the WiScale app. If you have the urge to communicate your increasingly chunky baby’s weight gain, the app can be set to share new readings with your pediatrician, family and friends, and also post results to Facebook, Twitter or selected email addresses. You can even take photos with your phone and attach them to the new readings. 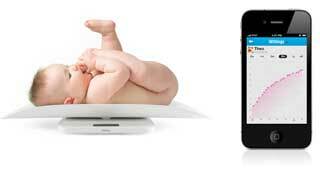 Pricing hasn’t been announced yet, but the Smart Baby Scale is scheduled to ship in the spring. For additional information, visit withings.com.